Hi everybody. I’m Jamie from Fong Songs, a cover blog you may know since Boyhowdy has been over once or twice (or thrice) to guest post. Unless I completely imagined it, there was an open invitation at some point for me to return the favour and guest post here on Cover Lay Down. Boyhowdy’s still hampered with technical difficulties at the moment, so it’s a perfect excuse for me to step into his usual Wednesday timeslot and lay down some folk covers for you. If you go back to the very first post ever on Cover Lay Down, Boyhowdy once praised my “incredible ability to compile cross-genre coverlists the likes of which [he's] never seen”. That just warms my little ego, but I think what he’s getting it at is that I sometimes come up with bizarre excuses to thematically link random cover songs. With the prospect of producing an all-folk cover post, I struggled to come up with an appropriately Fong Songs-esque theme of folk covers, but luckily whatever I do is inherently Fong Songs-esque. As Boyhowdy can attest to, the definition of folk music is rather elusive with modern folk festivals pushing the boundaries of what’s considered folk music. I’ve gone with some relatively safe bets: Dylan, Simon & Garfunkel, and a couple “man and an acoustic guitar” covers. 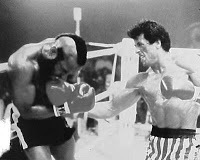 I strongly associate folk music with storytelling and that certainly applies to the following batch of cover songs… even if it’s the story of Rocky Balboa. Today on Cover Lay Down: tales of boxers as told via folk covers. 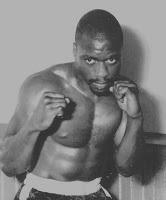 In 1966, Rubin “Hurricane” Carter, a pro middleweight boxer, was arrested and later convicted for a grisly triple murder, a crime for which he steadfastly maintained his innocence. In 1974 while in prison he wrote his autobiography, which inspired Bob Dylan to take up his cause and write this protest song. Eventually he was released on appeal in 1985 after nearly 20 years in prison. Canadian filmmaker Norman Jewison directed a film version of Carter’s story, 1999′s Hurricane, with Denzel Washington in the title role. Even though there was controversy regarding the fictional liberties taken in the film (in addition to debate of Carter’s innocence in the first place), I remember it being an excellent film with strong acting as usual from Mr. Washington who seems to be drawn to these real-life roles. Just don’t ask me what really happened. Here’s an acoustic Spanish language cover of Hurricane by a musician that simply goes as Lucas. My Spanish is downright non-existent, so for all I know this very well may be a Spanish parody about a guy named Harry Kein. I remember taking my dad’s Simon & Garfunkel’s Greatest Hits CD, lying in the dark, and cranking The Boxer on my discman. Li-la-li, kaBOOOM! Still gives me shivers when I’m in a particular mood. I first heard this cover by Colin Linden (woo, Canadian content!) during the end credits of the Coen Brothers film Intolerable Cruelty. I’m somewhat notorious among friends for lingering around to watch movie credits and sometimes it’s just because I’m listening to the music (plus the song credits always come at the very end!). I’m not particularly well-versed in the Bob Dylan canon, so needless to say I was shocked to hear this “other” voice he sometimes sings with, completely unrecognizable from the oft parodied Dylan vocals. From 1970′s poorly received Self Portrait, a double album of mostly cover songs, Dylan takes on the now classic ballad by Simon & Garfunkel, though the original itself had only been recorded in the previous year. Some have speculated that Paul Simon actually wrote The Boxer about Bob Dylan, but there doesn’t seem to be any solid evidence behind this claim. This great acoustic cover is from the Australian cover compilation Andrew Denton’s Musical Challenge, which features artists covering unlikely songs. Want to hear children’s group The Wiggles cover Lou Reed? Now you know where to go. Yes, Muhammad Ali recorded an album titled I Am the Greatest under his birth name Cassius Clay in 1963 at age 21 before his name change and even before he became World Heavyweight Champion. I haven’t actually heard the whole thing, but I understand it’s a spoken word album with poetry readings, sketches, and him answering questions from a live audience. The track listing includes titles such as I Am the Double Greatest, Funny You Should Ask, and Will The Real Sonny Liston Please Fall Down. Luckily for our purposes, Ali also recorded a cover song of Ben E. King’s classic Stand By Me. From their debut self-titled album, Ben Folds wrote this poignant song about an imaginary conversation between Muhammad Ali and Howard Cosell, in which Ali contemplates hanging up the gloves. Probably the only studio-released cover of any Ben Folds Five song is by, of all people, Bette Midler, who recorded this for her 1998 album Bathhouse Betty. And so begins the tale of George Chuvalo, legendary Canadian heavyweight champion who twice went toe to toe with Muhammad Ali, though lost both by decision. Known for having never been knocked down in the ring in 93 fights during a professional career that spanned over 20 years, perhaps his greatest legacy evolved outside the ring. As told in this tribute by Ontario musicians Friendly Rich & The Lollipop People, Chuvalo tragically lost three of his sons and his wife in drug-related deaths (full story in this in-depth Maclean’s article). True to his stalwart nature, since 1995 Chuvalo became a tireless anti-drug advocate and today still gives talks to students, parents, and other support groups. In 1998, he was appointed to the Order of Canada for his work. Visit George Chuvalo’s Fight Against Drugs for more on Chuvalo’s story and cause. Colin Linden, who is also one-third of folk group Blackie & The Rodeo Kings, wrote his own tribute to George Chuvalo. Little bit of trivia for you: Chuvalo took on some bit parts in films over the years including a bar patron named Marky who has an ill-fated arm wrestling match with Jeff Goldblum in David Cronenberg’s The Fly. Check the CBC digital archives for numerous fascinating video and audio clips of George Chuvalo including the original CBC radio broadcast of his fight with Ali and his 1977 appearance on a CBC talk show with his thoughts on the newly released Rocky. Amusingly, when he’s introduced by host Peter Gzowski, the house band plays a 15 second muzak version of The Boxer as Chuvalo walks on stage. Thanks to Boyhowdy for letting me stop by and share some folk covers with you. Hopefully his computer issues get sorted out soon!